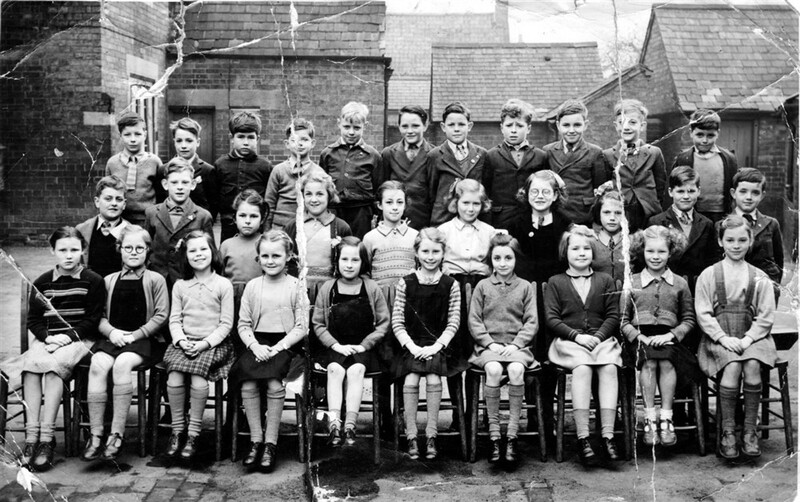 Another picture of the village school children around 1950. Back row, LtoR, John Moulsher, Robin Wysall, ? , ? , John Ball, ? , ? , Cyril Plummer, Brian Burdett, Desmond Rayson, Tom Fisher. Middle row, LtoR, Michael Titcome, Pat Christmas, Joice Gale, ? , ? , Angela Bradshaw, Yolande Norris, Jennie Norris, Malcolm Langton, Frank Wilkinson. Front row, LtoR, ? , ? Parr, ?, Wendy Topps, Brenda Jackson, Brenda Sellers, Maureen Guy, ? , Jean Dunsmore, ? . Next to Yolande is her sister Carole Norris. Not Jenny as mentioned. Many thanks Alan for your interest and ammendment to the list of names. I think the fifth person on the right back row is John Mumby. Person in middle row left is Michael Titcomb who lived in Stathern. The person on the right of Brenda Sellars, 4th from right is not Maureen Guy but Brenda Rayson who live in Belvoir Avenue.